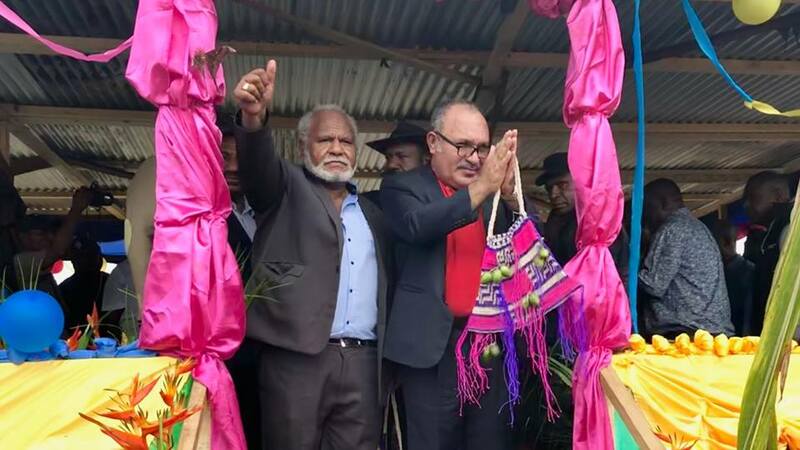 Prime Minister O’Neill has arrived at Usino Station in Madang Province to launch the Usino Bundi Five Year Development Plan and to launch a range of projects. Greeted by the Governor of Madang, Peter Yama, and Member for Usino Bundi, Jimmy Uguro, the Prime Minister’s delegation was greeted by around 7,000 people who braved the rain to be a part of the opening of these significant projects. Member Uguro thanked the Prime Minister for coming to Usino. “You are only the second Prime Minister to ever come to our district in the history of the Nation. “You made sure you got here today, even though the first time you tried this morning rain and clouds meant the helicopter could not make it through. Governor Yama welcomed the Prime Minister to Madang Province. “I have talked with Prime Minister for many years bout the development of resource projects, even many years before he was the Prime Minister. “Too many times in the past national government came to Madang with promises and signed many MOUs. “But these MOUs never went anywhere or led to anything, but we know with Peter O’Neill the things he promises he delivers. “This Prime Minister delivered APEC to Papua New Guinea. He brought the world leaders of the biggest countries to Papua New Guinea.